Surfing Santas Cocoa Beach is an annual Cocoa Beach tradition that brings hundreds of surfers of all ages dressed up as Santa. The costumes are as diverse as the people that wear them. Watch them ride in on the waves and kick off your holiday beachside at this free event that benefits local, charitable causes. Now in its second year, the crowd can participate in a costume contest. Dress up in your favorite winter themed outfit – snowman, Santa and Mrs. Claus, gingerbread man, reindeer, elves – for your chance to win prizes. This year there will be five categories: babies (0-3), kids (4-15), group (2 people or more), men (16+), and women (16+). Costume contest starts at 9 a.m. followed by Santa surfs out at 10 a.m. There are no rules, so anything goes…well almost! This is a family-friendly event, so please keep that in mind. To ensure the safety of both surfers and spectators, the Cocoa Beach police, fire department, life guards and EMT personnel are on site. Cash prizes for first through third place: $50 for first, $25 for second, $15 for third in individual categories and $100 for first, $50 for 2nd and $30 for third in the group category. One Grand Prize winner, the peoples choice from the first place winners, will win a Surfing Santas Surfboard! 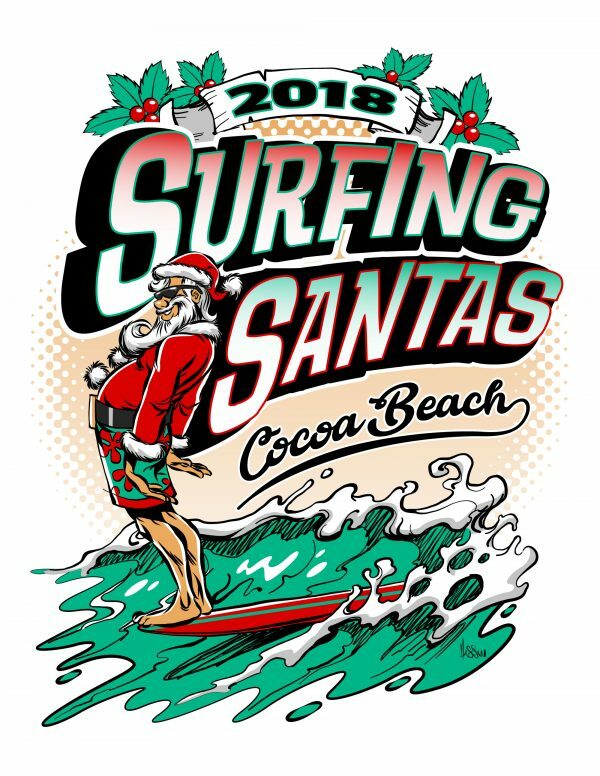 Surfing Santas Cocoa Beach takes great pride in helping those in need. With every piece of Surfing Santas Swag sold , we’ve been able to raise over $100,000 for local charities. There are two charities dear to Surfing Santas Cocoa Beach – The Florida Surf Museum and Grind for Life. Since 2014, this event has been made possible by the efforts of The Florida Surf Museum, the Trosset family and and its many volunteers. The Florida Surf Museum preserves and documents the unique history and culture of Florida surfing. Experience the heritage and traditions of the surfing community through events, exhibits and programs.